Current Market Analysis: Most notes from Alabama are heavily circulated. This state has always been underprivileged economically, so people couldn’t afford to hold currency just for the sake of saving it. Any note in XF condition or better should sell for a nice premium. 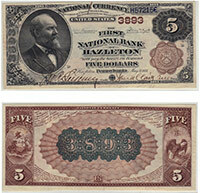 First charter notes and denominations higher than $20 are scarce. Most towns in Alabama are small. You really can’t say that notes from small towns are rare, but if you get the right mix of grade and rarity, then you have a great find. Notes from Alabama have been more popular in years past, but there is still a chance for the good stuff to sell for thousands of dollars. We buy all antique paper money issued by The First National Bank of Selma, AL. We can tell you how much your $5 bill is worth. We aren’t just dealers. We are also collectors, experts, and appraisers. We have contributed to numerous price guides and are considered specialists in the field of national currency. Contact us via phone or email to get your free appraisal today.